Hahah, spot on Clare. With my big feet, white shoes are definitely to be avoided. As with everything, it depends on who is wearing it. Like with many trends, it takes me a while to “get” it. This post convinced me that white booties would work well with my aesthetic. I have the ones by The Row and love them – so chic with just about everything in my closet. I like the lines of all you show. The pointed toe with the small heel is very flattering. Rebecca Minkoff has one at an easy to take price point, easy to walk in kitten heel. I think I’m doing a white mule instead. 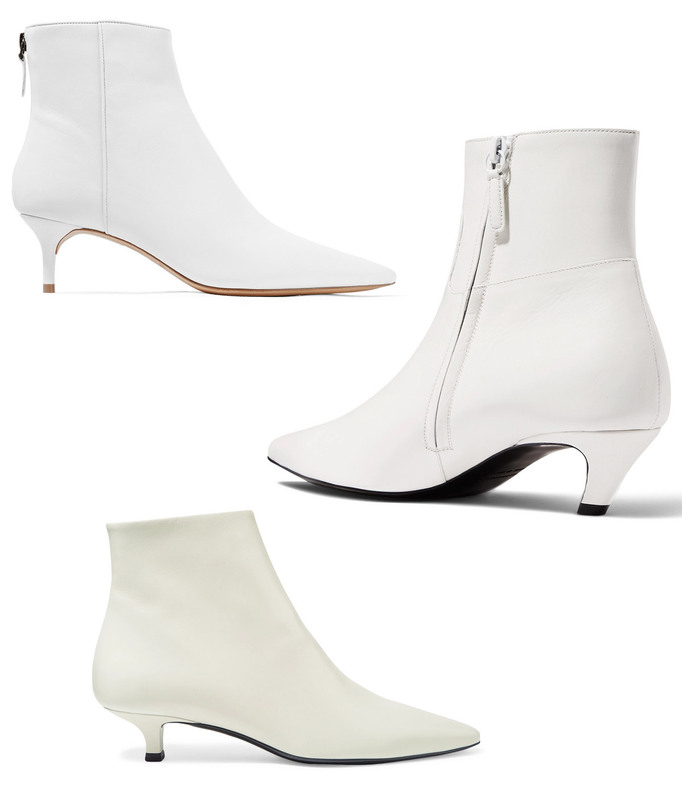 I wouldnt wear white boots as an everyday look, I would destroy them in a week! Love! And I think these would look great on you! I am not in a place that would allow for white boots so you would be doing me a favor if you could buy these, wear them with your black skirt, and post an outfit post that will provide inspiration and, for some us, amplified longing. Thank you for the excellent eye and willingness to share!! I just bought the ones you linked that you bought – I don’t know that I’ll wear them enough to justify paying more, but these look perfect. Also love the chalk rather than pure white. Thanks! They look wonderful here but in a year I would look at them and wonder what was I thinking. I think I’ll let this trend pass me by.